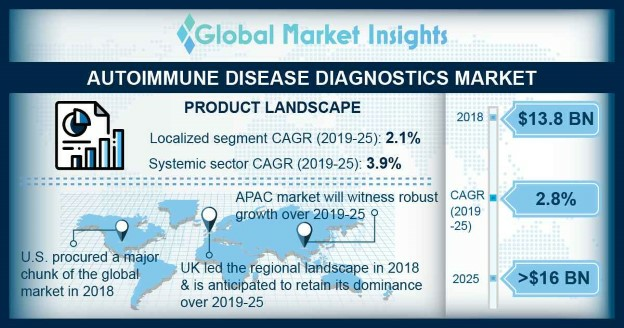 Autoimmune Disease Diagnostics Market size is set to exceed USD 16.0 billion by 2025; according to a new research report by Global Market Insights, Inc. Rising prevalence of autoimmune disorders such as rheumatoid arthritis, Hashimoto’s thyroiditis, type 1 diabetes and Grave’s disease will drive the global autoimmune disease diagnostics market. Growing patient awareness levels pertaining to autoimmune diseases due to the launch of national awareness campaigns will further fuel industry expansion. Presence of favorable government initiatives such as The Cooperative Study Group for Autoimmune Disease Prevention (CSGADP) and NIH’s HLA Region Genetics in Immune-Mediated Diseases Consortium for autoimmune diseases diagnosis and treatment will augment industry growth. Advancement in technology such as lab automation developed to cater the need of increasing diagnostic procedures is another growth rendering driver. Moreover, favorable research funding programs conducted by various organizations and NIH to reduce cost burden for these diseases will favor industry expansion. Lack of skilled healthcare professionals and experts coupled with long and complex diagnosis process for autoimmune disease will hamper business growth. Low lab automation rate leads to increasing diagnosis turnaround time which further impedes the market growth. Localized autoimmune disease diagnostics held higher market share in 2016 and should show a similar trend over the forecast years owing to the increasing prevalence of gastrointestinal autoimmune diseases such as Crohn’s disease, Grave’s disease and multiple sclerosis affecting the specific organ. Systemic disease diagnostics is poised to be the fastest growing segment with a CAGR of 3.9% owing to rising cases of rheumatoid arthritis and systemic lupus erythematosus across the globe. UK autoimmune disease diagnostics market should witness considerable growth over the coming years. Increasing prevalence of systemic disorders such as rheumatoid arthritis coupled with improving public awareness levels through efforts of organizations such as National Rheumatoid Arthritis Society (NRAS) should augment regional growth. China autoimmune disease diagnostic market should grow at robust rate with growing prevalence of autoimmune pancreatitis, improving healthcare infrastructure coupled with increased R&D efforts and rising patient awareness levels. Some of the key industry players operating in global autoimmune disease diagnostics market are Siemens Healthcare, Roche Diagnostics, Abbott Laboratories, BioMerieux, EUROIMMUN and Quest Diagnostics. The industry players attempt to enhance their market foothold by opting strategies such as agreements and partnerships. The companies are also developing cost-effective solutions and modules for ease in detection of autoimmune disorders. For instance, in July 2016, FDA cleared Inova diagnostics’ QUANTA Flash dsDNA, QUANTA Flash Scl-70 and QUANTA Flash Jo-1 which aids in the early diagnosis of systemic lupus erythematosus.